I had quickly made my way back to Mauville City and decided to venture north after looking at the map, noticing that Lavaridge Town had a Gym. A few trainers had gathered, I ploughed through them with relative ease. There was a house to the side in Route 111 belonging to the Winstrate family; a challenge was posed to beat all four of them in a row. Jay dispatched of all four, despite it being a large struggle. Whilst congratulating me (and giving me a Macho Brace as a reward) they put more of a focus to their son who was preparing for the Pokémon League. Feeling somewhat confident, I arrogantly claimed I would beat him too. Moving onwards, I saw a pair from a television crew trying to interview various trainers; intrigued I strolled up to them. “I don't suppose you'd be willing to do an interview?” The woman with the microphone asked, almost in a defeated tone. “Of course. My name's GL,” I smiled in response. Upon hearing the name her eyes began to light up. “Did you hear that Ty? This is the kid who's been causing Team Aqua trouble? Quick, start rolling the camera!” She whispered excitedly into the camera man's ear. She then fixed her attention back to me. “So, you're GL? My name's Gabby. For the first part of this interview I think the best way to showcase your talent would be to have a Pokémon battle so we can help create a profile for you. Does that sound good?” She asked, eyes continuing to shine. “That sounds fine,” I said, releasing my Pokémon in the process. Immediately, I instructed Jay to use Fake Out to deal with the Whismur and Oscar hit an Ember to defeat the Magnemite. “... it's over already. Wow, you're the real deal!” The pair muttered simultaneously. I chuckled as I withdrew my Pokémon. “What's next then?” I asked, smile beaming from my face. “Okay, how would you describe your team?” Gabby questioned, notepad on hand. “Incredible. Without my Pokémon I'm nothing, the credit belongs to them,” Gabby began to scribble furiously on the paper, nodding as she wrote. “It's... hard to explain right now. I just use it as inspiration though...” I mumbled, not wanting to get too emotional over it. Gabby dropped the pen in shock before looking deep into my eyes. “Wow, you're ambitious. Don't you think that's somewhat unrealistic?” She queried, eyebrow raised. “Not at all, I've got three badges already. I'm only getting stronger and my aim is to prove that we can be the best team in Hoenn. If I don't believe we can win then who else will?” I explained, causing Gabby to smile proudly. “I helped protect Captain Stern, yes. As for Team Magma, I have no association with them,” I stated firmly. Gabby sighed in response, signalling for the camera to stop rolling. “So you're really not in Team Magma? It's just they've got a new kid in their ranks who's causing a lot of interest in the media. No one knows who he is, all we know is that he's very strong,” She whispered suspiciously, this time I raised an eyebrow. “So that's what Professor Birch was on about... this is the first I've heard about this person specfically. Sorry I can't give you an exciting story,” I laughed. After the interview I carried on along the pass; the desert to the north was too harsh and unpassable so I redirected myself towards Mt. Chimney. On route I managed to catch a Numel before noticing a 'CLOSED' sign outside the cable cart, meaning I would not be able to go to Lavaridge Town yet. Still, I proceeded through the Fiery Path and battled some trainers outside. The volume of battles were taking its toll on Jay especially; he had accumulated wounds and a strong burn. Panicking, I knocked on the door of a nearby house; an older woman appeared from the other side. “Excuse me, I don't suppose we could rest here? It's been a long day,” I asked frantically. “Of course you can dear. Stay as long as you like.” She said in a welcoming tone. I left my Pokémon in her disposal as I lay down upstairs in the guest room. After a few hours I was awoken by our host, shaking me as she pointed to the television. “You're on the television!” She shouted excitedly as my eyes slowly opened. I rose my upper body up and looked at the television, surprised more than anything to see it so soon. As the interview went on, my interest in it decreased more and more, unlike the old woman who seemed delighted to be in the presence of me. “So, you're a star! I would never have guessed that!” She exclaimed, causing me to nervously chuckle. BREAKING NEWS. BREAKING NEWS. Team Magma have been spotted in and around Fallarbor Town. Please report any villainous activities you see. I immediately jumped from my position and sprinted over to where my Pokéballs were. “I'm sorry ma'am but I've got to see what's going on, thanks for the great hospitality!” I urgently shouted as I gathered all my belongings together. “Are you sure you're fully rested?” She asked somewhat hesitantly. “It'll be fine, I'm a star remember,” I cheekily smiled as I left the house. I ran into Route 113 as the soft, volcanic ash began to fall slowly onto and around me, they felt like small blanket drops that, once accumulated, almost comforted me. I stopped and caught a tiny clump in my head and looked into it before the wind blew it away. A teenager began to walk over to me. “You can collect the ash you know, my boss can give you a Soot Sack to collect it. We're based in the building over there,” He instructed before heading back towards the building. Intrigued, I started to follow him and, after a few minutes, entered and met with the owner. He quickly threw a bag at me, catching me surprise. “Collect enough of the stuff and I can make you a selection of items, free of charge,” He smiled as he revealed a selection of items he had made for display. “That's impressive, I'll see what I can do when I get chance. By the way, if you see anyone from Team Magma around, give me a heads up,” I explained. “Oh, you mean like the guy walking out there now?” The teenager said as he peered out of the window. I jumped over to his position and stood alongside him, staring outside to see the person he was referring to. I quickly forced the Soot Sack into my bag. “I don't know when I'll collect enough ash, I've got to sort this out. Thanks though!” I yelled as I bolted out of the building and towards the figure. They were dressed in a modified version of the traditional Grunt outfit outlined in the news report. “Stop right there! 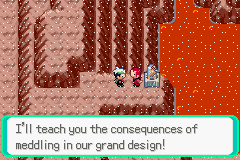 What are you doing here Magma?” I intrigued confidently. The person stopped in their tracks before turning to face me. “I'm going to tell the boss to go forward with our plans. It's pretty standard stuff really,” he explained in a consistent tone, unfazed by my approach. “Well then, tell your boss that your plans should stop now. Your villainous ways are over!” I barked, trying to get some kind of reaction from him; all he did was laugh to himself. “This isn't funny! Let's go Jay!” I released the Lombre from its ball and it began to stretch following its small rest. “You don't want to do this,” the Magma member muttered. “I'm not letting you go!” I yelled as my eagerness began to take over from my rational thinking. “I don't want to do this. You won't want to do this because you'll lose. You'll lose and it won't be pretty. Although... maybe losing would be a good thing for you,” he pondered as he looked sternly at Jay. “Fine. Have it your way,” he responded, causing me to smile sharply as if I'd won the mental battle. He threw a Pokéball to the ground, letting out a Pokémon I hadn't seen before; the ash began to land on it and blend in with its shining white fur until it shook it off. It looked into the eyes of Jay before turning back to its trainer, who simply nodded. “Okay Jay, use Fake Out!” I ordered in an attempt to get the advantage. The Magma member stood still and watched as his Pokémon took the hit. “If you carry on like this the match will be over instantly,” I cockily claimed. “Prepare a Razor Wind. GL, you've got time whilst the move is being prepared. Give up now or face the consequences,” He ordered, almost as if he had been awoken from a deep slumber. “Time's ticking; give up now or face the consequences,” He interrupted, almost pleading with me to stop. “I'll never give up; Jay, use Nature Power to gather the ashes to form an attack!” I ordered confidently. The Magma member sighed and looked down into the ground as he shook his head. Jay concentrated as the ashes seemed to move closer to him. “End this!” he barked as his Pokémon obliged; it leapt into the air before swiping its sickle-shaped horn in the direction of Jay. A huge force dispersed from it and moved at an incredible rate; blowing all of the ash past the Lombre and catching it with a direct hit. Flying about ten metres back, Jay remained still, lying unconscious, unable to continue. “Jay!! No!” I shrieked as I sprinted towards my fallen Pokémon. “How many Pokémon do you have left?” The figure asked as he walked towards his Pokémon, stroking its fur. “O... One...” I muttered as I grasped Oscar's Pokéball tightly, gritting my teeth in the process. “Right. Take this and use it on it. Next time make sure your Pokémon are ready because if they're not ready then you aren't, no matter how confident you may be. Your Lombre was still in pain, it wasn't given a proper chance to recover,” he explained as he threw a Full Restore in my direction. I looked at it, thinking about what happened. As he returned his Pokémon to its Pokéball I realised who it was. “You're the guy I'm getting confused for! How do you know who I am? Are you pretending to be me?” I asked frantically. “Leave your Lombre with someone you trust. You won't want to be using it for battle any more. Train hard, the rest of Team Magma are going to steal the Meteorite in Meteor Falls tomorrow. There's no point intervening now, Cozmo won't believe you. Just come better prepared, it could get explosive,” He explained, turning away from me. “I'm not pretending to be you, but I wish I was you. You've got it easy,” He muttered, moreso to himself, as he walked out of the ash and back towards Route 111. Still feeling unsatisifed, I sprinted after him but as soon as I turned the corner he had gone. I sighed before moving back through the ash; as it fell instead of a calming feeling it had been replaced by a weight of guilt pushing down on me. Aww, well yeah, stuff happens, and you incorporated it excellently into the plot. I'm very excited to see where it goes from here, for sure. Hope you have better luck from here on! I rushed into Fallarbor Town and frantically gave Jay to the nurse, hoping she could work a miracle. Whilst Jay was somewhat healthy after her work, there seemed to be some lasting damage. I decided to use the PC in the PokéCenter to ring Wally's uncle, leaving him in their care after the wonders they did for Wally. At this point a woman approached me; her name was Lanette and it turned out that she was the creator of the PC system in Hoenn. She invited me to her house in Route 114, I obliged and we discussed various Pokémon things. We even went through my PC and she gave me tips on how to manage it better, as well as a nice Lotad doll for decorative and nostalgia purposes. Outside, I caught a Swablu and named it Fluffy. At this point, I withdrew Poseidon, the Magikarp I caught in Dewford, due to remembering from PokéSchool how some initially weak Pokémon can grow into much stronger ones. Unfortunately, as soon as I released it from its ball it flopped all over the place, making it virtually useless at this stage. Both Oscar and Fluffy watched it struggle like a fish out of water and sighed simultaneously. As a resultance of its incompetence, I decided to attack the Exp. Share I received from Mr. Stone onto it whilst focusing on training the other two. We spent the whole day training vigorously; even before Poseidon showed any signs of capability in battle Oscar grew into a Blaziken and looked razor sharp for battle. I took it slower with Fluffy, immediately thinking back to how easily Jay got decimated due to its natural frailties. Each battle I approached more strategically, not putting her in too much risk. The hours began to pass quickly but she was showing signs of development; her clouds looked firmer and she grew in size; most importantly she was looking more and more confident in battle. I allowed her to rest as Poseidon finally looked able to do something; he had began to focus his movements in a directed manner, tackling and causing damage to enemy Pokémon. Another hour or so passed before the time and effort began to pay off, to my amazement it evolved into a Gyarados. From this point, training got a lot easier. Whilst it took time for Poseidon to get to the same stage as Oscar it was a relatively straight forward process. Encounter an enemy, unleash the power, experience gained. Poseidon really was beginning to represent his namesake well, at times seeming untouchable in battle. After her rest, Fluffy felt rejuvinated and began to work hard once more, finally evolving into an Altaria before the day was over. Unfortunately, we had spent so much time training and strategizing that by the time we were done the PokéCenter in Fallarbor Town had closed and I did not feel it was worth travelling all the way back to Mauville City to risk the PokéCenter in there. Luckily, Lanette had allowed me to stay at hers after our previous conversation. I left my PokéBalls on this operating station she had created which allowed them to recover over nightwwhilst I took some time outside to reflect in my thoughts. I sat down on the bridge and stared into the distance, seeing the dark water shine brilliantly with the stars and the moon creating a hopeful atmosphere. Even though we had worked so hard all day I still had the lingering thoughts dominate me. For the first time I had a feeling of nervousness about me as a Pokémon trainer. Usually I would be worried about family; worried that Mum and Dad would never get back together; those thoughts were still there, pushed into the background for the time being. The water almost began to sing as the weak waves sloshed together yet all I could hear was the impact from the Razor Wind on Jay. I sighed heavily before rising up from my position and began to walk into town and then into the volcanic ash. The ash had accumulated thickly onto the ground as the lack of wind in the night allowed it to remain in position and whilst everything seemed so pure and untouched all I could see was the broken carcass of Jay and the shape it had created in the ash. I staggered to the spot where he had fallen and grabbed a pile of the ash before allowing it to slowly escape my hand. I couldn't shake the thought of possibly failing again and at this point there was nothing to distract me from the strong thoughts crippling my confidence. Could I stop Team Magma tomorrow? I sighed heavily before strolling back, head down, trying to remain thoughtless. My PokéNav vibrated heavily on the bedside table, giving me a scare as I slowly opened my eyes. I picked the device up halfheartedly after only receiving a small amount of sleep. “You've got an hour until we meet with Cozmo. If you want to make a change happen then make sure you're completely ready.” I paused for a second, concentrating in an attempt to work out the voice. My eyelids shot open fully as I realised it was the Team Magma member from yesterday. “Why... why are you helping me?” I asked quickly as I leapt out of bed, attempting to get all of my things together. “You know what you want to do... if you can do what you want to then you shouldn't be stopped.” The voice muttered before hanging up. I wasted no time in getting dressed and sprinted out of the door without giving myself a chance to properly thank Lanette. As I left the house I noticed a quirky looking professor stroll towards Meteor Falls; believing this to be Cozmo, mainly due to the rock he was holding tightly, I began to follow nonchelantly in the hope of looking unsuspicious. Meteor Falls was beautiful, the stalagmites almost shaped together to create moon craters and was accompanied by the crashing sound of a waterfall in the distance. Water dripped from the stalactites onto the ground, helping to create a wet but wonderful collage of sounds. Holes in the cave allowed the sun to create almost a spotlight onto the area Cozmo was standing. I hid in a climbable area out of the way to monitor the situation; a Solrock noticed me and tried to pester, in an attempt to quieten it I managed to catch it. At one point I thought Cozmo noticed me, focusing his line of sight towards the area I was hiding; just as he seemed to slowly move towards it, Team Magma arrived. “Ahh, Cozmo! I'm so happy to see you arrived!” The leader of the pack beamed as he reached to shake his hand. “Where's Maxie? He was the one who wanted to speak to me?” Cozmo nervously asked as the members seemed to swarm around him; withholding the invitation to shake hands. All he got was an evil chuckle in response. Things went silent for a few seconds as Team Magma awaited Cozmo to make the next move, until a massive buzzing sound arose from around me. I realised immediately it was my PokéNav, looking at it, I saw that Wally was trying to ring me. Noticing that all of the people in the spotlight had now noticed me, I muttered something Mum would not appreciate me saying to myself before rejecting the call. “It seems we have a spy. You lot, grab Cozmo and hold onto the Meteorite. Numel, use Magnitude to shake the kid out,” The Magma member ordered sharply as he released his Pokémon. The cave around me began to shake viciously, parts breaking off, which caused me to fall down onto their level. Whilst not overly injured, I was in more danger as I was quickly grabbed by the collar. “Ah, so you're the kid who got involved with Team Aqua's plans. Maxie warned you might be around, looks like I might get to have some fun here...” He angrily whispered as he began to clench his spare fist tightly. I gulped loudly, fearing I was going to get hurt. “Let him go Tabitha, we've got bigger things to worry about. Team Aqua have been sighted in the distance,” another Magma member interrupted. “It seems it's your lucky day kid. Take the Meteorite and scram,” Tabitha spat as he threw me onto the ground. The flock of Team Magma members sprinted out of the cave, leaving both me and Cozmo shaken on the ground. “Are you alright?” I asked Cozmo as I dusted myself off, trying to retain confidence. “I'm alive at least. I don't know why I trusted those goons,” Cozmo replied in a defeated tone. “Everyone knows you're a sucker for money Cozmo!” A raspy voice yelled from the opposite side of the cave. Fixing my attention over to there, I immediately recognised that it was Archie with a rabble of Aqua grunts. “Looks like you being in our business could be a good thing for once kid. We need to get to Mt. Chimney to stop Team Magma before it's too late and we could use as much help as possible,” He explained as he came closer to us, still looking as angry as ever, despite the more welcoming approach. My PokéNav began to buzz strongly again; Archie nodded, allowing me to answer. “Hey GL! I thought I'd let you know that I saw Team Magma take the cable cart up to Mt. Chimney since I know you like getting involved with that sort of thing!” Wally joyfully exclaimed. I sighed before responding. “Yeah, I already know. Kinda found out the hard way actually. It's good to know you're here though, you're going to help us stop them,” I explained, almost biting at him. “Wait... w-w-what? !” He asked; fear outlined in his crackled tone. Archie grabbed my PokéNav from me, grimacing at the device. “Look, I don't know who you are, I don't care actually. If the kid trusts you, you're getting involved. Just wait by the cable car, we'll be there in minutes. If I find out you've ran away we will hunt you down and make your life a living hell so you might not want to disobey me!” He barked aggressively before throwing the PokéNav back at me after hanging up. “You didn't have to be so ruthless with him...” I muttered as he started to walk away, causing him to stop. “Your childlike etiquette will only get you so far. The world's a cruel mistress right now. If Maxie completes his plan with that Meteorite all that will remain is pure land mass. I can't let that happen. Just asking your friend to help wouldn't work, he'd feel out of his depth. I can't imagine him having the same blind confidence that you do,” Archie explained almost as violently. “But nothing. We've got work to do if you want to carry on being flavour of the month kid,” He interrupted before leaving the cave with his team closely following him. I looked back at Cozmo to see he still looked rattled. “I'm sorry... I'll get the meteorite back for you... or at least try to...” I muttered, not particularly confidently, before sprinting after them all. Liking the back and forth with the teams so far, great job! Emerald was so good for that, they really made both teams stand out and it gave the plot a sense of urgency, making you feel like you had to stop both teams. Really great job with the writing, looking forward to the next post. I felt so out of place as I walked alongside Team Aqua towards Mt. Chimney. It felt like I was being immediately judged by the people we passed by. Luckily, it did not take us too long to reach our destination; at the base I saw a timid looking Wally, almost shaking in fear. I looked at Archie who seemed to facepalm and his decision to bring him in. “Hey Wally! I'm so sorry...” I awkwardly said as I ran up to him. Archie instructed his team to head up to the cable cart. “They're not going to do anything to my family are they? !” Wally asked in a panic. “No, not yet at least. We'll see you up there,” Archie snarled as he entered the cable cart. I sighed as I saw Wally start to freak out. “It'll be fine. I didn't think he'd be such a tyrant about it. I think it was just a release of his built up anger towards Team Magma. Plus, if anything, he'll target mine first,” I stated reassuringly. It was Wally's turn to sigh, almost as a relief. “So... what have I got to do?” Wally intrigued reluctantly. “You're right! I've just got to go out there and do my best to help!” Wally interrupted with a smile on his face. I chuckled slightly before heading towards the cable cart. We both sat inside and waited as it slowly progressed upwards, with each passing second the ash began to first become visible before getthing thicker and thicker; when we reached the top it was almost blizzard like terrority as the ash blew all over the place. The cable door opened and Wally, after a large sigh, jumped out and stopped, witnessing a barrage of gang members fighting each other. Attacks were flying all over the place with various Pokémon yelping and shrieking in pain. “This is terrible...” Wally muttered softly to himself, unable to understand the pure aggression on display. “I know, but it's more of a reason for us to make sure this kind of thing doesn't happen again. Come on, let's go,” I said, trying to usher him onwards. He nodded hesitantly as we took a few steps, before seeing behind us a group of media reporters sprint from the next cable car. They almost seemed to have the same predatoral, animalistic approach as the criminals. “Are you here to save the day again?” A woman asked as I tried to walk away; I realised it was Gabby from the interview. I looked at her, almost disgusted, before moving onwards. I saw Archie fighting off a number of Team Magma grunts with his Mightyena, almost relishing the opportunity. “Looks like you're enjoying this too much. Care to have a real challenge?” A Magma member stated as he looked Archie dead in the eye. Bullishly, the Aqua Leader welcomed the opportunity. “You'll regret this. Disaster, whenever you're ready,” He smiled as his Absol appeared behind him. He looked at me for a brief second before Archie did the same. “What do you think you're doing?! Get on with it!” Archie yelled ferociously at us, shaking me from my stare. “Right... I guess that's Maxie over there by that machine! Let's go!” I Instructed Wally as I began to run in that direction. I turned to Wally to make sure he was following until I was lifted from the ground. Tabitha had grabbed onto me in the same way as before, hurting me once more. I tried to wriggle out of his grasp yet he was too strong physically. “Let me go!” I shouted, flailing around to no avail. He laughed to himself heavily, grinning like a Cheshire Cat. “Drop him. Rara, you ready?” Wally boldly stated from behind, staring sharply at Tabitha. Dropping me, he began to stroll towards my friend. “So you think you're a tough guy eh?” Let's have it your way,” He sneered, releasing a Numel for battle. Wally's Ralts stood firm alongside its trainer before glowing brilliantly as it evolved into a Kirlia. “Just move on GL! Don't worry about us!” Wally barked at me as I rose from the ground. I nodded before sprinting towards Maxie. “So, it looks like you want to stop us. It's almost done, that's the problem for you. The Meteorite's in place, all that remains is for the configuration to be completed. I guess I've got time to deal with you personally until then, boy,” Maxie remarked as he slowly turned around from his machinery, somehow knowing that I was closing in on him. “Why are you doing this?” I asked inquisitively, causing him to scoff loudly. “Land is the cradle of all, it caused things of the past to live and grow effectively. With this meteorite I can harness that power and get this planet to position it needs to to thrive once more. I bet you've heard Archie ramble on about how the sea is all important but that's just a moronic mindset. Actually, I'm surprised you've sided with that cretin, from what I had heard you seemed much wiser than that,” Maxie explained, almost trying to get under my skin. “I'm not siding with them, I'm just siding against you,” I laughed, releasing Poseidon from his ball. Maxie unleashed his Camerupt who seemed ready for the battle. I sighed to myself, mind shrouded in self doubt. The Magma Leader picked up on it and began to laugh, tormenting me. “No, I can't let you win. Poseidon, use Bite!” I yelled as I tried to shake off the doubts. Poseidon threw itself violently at the Camerupt, clenching his large fangs into its side, causing large damage. “Drive it off Camerupt with Tackle,” Maxie instructed, remaining cool in the situation. His Camerupt began to sprint forwards, trying to shake it off but the strength in Poseidon's jaw was too much. With each step the Gyarados began to dig in harder, creating more and more pain. The Camerupt's eyes began to water in pain. Maxie grunted, realising his strategy was not working. “Fine, singe it off with Ember,” he responded; a small fire ball left the Camerupt's mouth which caught the tail of Poseidon, causing small damage. Maxie ordered the attack again and again, eventually causing Poseidon to let go as the burn began to seep in. I began to think back to Jay and how the burns damaged it to the point of no return. Shrieking in pain, Poisedon began to fling itself around to try and shake it off. “I can't let this happen again... Poseidon, fire everything you've got with Dragon Rage!” I cried as my Gyarados let out a massively excruciating roar on the ears. Maxie shook his head as he saw Poisedon gather a huge amount of energy and firing a blast at and beyond the Camerupt, damaging the machinery behind. The Meteorite dropped to the ground before rolling out of the way. “There's no point carrying this on. You've ruined our plans for now...” Maxie bitterly muttered as he returned his Pokémon and walked away. The rest of the Magma members continued to finish their battles before heading off, leaving Team Aqua, Wally and I as the sole figures in front of the cameras. “Urgh, you can all go away now! Go, now!” Archie blasted at the media, causing to scurry off. “Why are you so angry? We stopped them didn't we?” I asked loudly, puzzled by his disposition. “We won the battle but look at my men. They all lost and look so defeated. Look at your friend here, he lost too. Even I lost... you only managed it by the skin of your teeth. Why would they just give up? It just doesn't make sense! They had us in the palm of their hand and walked away!” Archie ranted, frustrated to the point of punching a section of the mountain, creating a large hole in it. “It's not a war Archie! There's more to this than that! You both need to stop with these false dreams because it's going to end up causing my harm than good!” I shouted back at him, trying to get into his mind. “You don't get it. This is a goddamn war and people will get hurt. We've got to work so much harder to get what we want. All of the blood, sweat and tears will be worth it. The last time was a warning kid, this time it's a guarantee; if you get involved in our actions any further, you will get crushed. Same for your little pal over there too, or any other friends you have. Let's go men...” Archie yelled, amping up the viciousness. He directed his men back down the cable cart, distraught with the result. “I think I'm going to go too GL...” Wally piped in nervously. “No, after today I know you'll need all the help you can get. Today was darker than I thought... it felt like a violation against Pokémon. I can't let that happen. I'll help in whatever way I can,” He interrupted before leaving the area. I stood alone and looked around for the Meteorite, knowing that Cozmo would want it back. I turned around to find a sole Magma Grunt holding the Meteorite; it looked as if parts had crumbled off of it. “Take it. I doubt Maxie will want it, I certainly don't have a reason to keep it,” He said, throwing it in my direction. I caught it with ease and placed it into my bag. “You did a good job today. I think if the battle had a true conclusion you would have beat Maxie,” he added assuringly. “Thanks... I guess you beat Archie then, huh?” I enquired, eyebrow raised. “Yeah. He's too aggressive, it made it easy to pick him off,” He responded, tone unchanged. It surprised me, I knew if I had beaten Archie I would have been delighted with myself. “Can I just ask you something before you leave me with more questions than answers again?” I added, realising he was about to leave. “Why did you join Team Magma? I mean, you beat Archie, you pretty much told me what to do and ended up costing Maxie his goal, I just don't get it...?” The Magma grunt chuckled to himself. There was a long pause as I tried to dissect the answer given to me. I still did not understand it and I think he realised that too as he sighed dispondently. “At least tell me your name then?” I interrupted. Again, he responded with a chuckle. “There isn't a single person in Team Magma who knows my name. They call me Blaze... I guess you can know. My name's Kai,” He smiled before heading down the pass, leaving me to ponder everything that had happened.